Hello! Welcome to my little spot for musings. I come up with ideas from time to time and then they are soon forgotten. Well, No More! Here they will grow and we'll see what they become collectively. Does this look a bit like pictures you drew as a kid? Sometimes our lives are like that.We have this picture of how things should be in our lives. Then "Bad Things" happen. Things don't go according to plan. There is a fun little game the kids would play in church, where we'd bring little note-sized scratch paper and something to write with. The game starts with one of us drawing some random things on the page, then hands it to someone else, challenging them to make a picture out of it. Sometimes we even have an idea in mind when we hand them the scribbles. 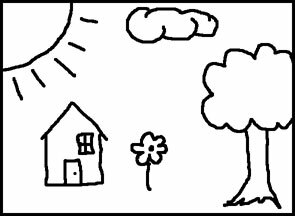 As you can see, this doesn't quite fit the idea of a house-tree-sun scene. I think that Romans 8:28 is kind of like the picture challenges. We have our life's plan pictured in our minds... we have ideas about how things should go. 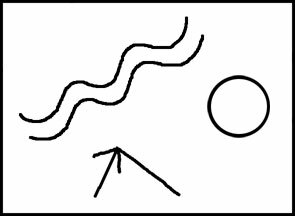 Then life hands us squiggly lines and random shapes and they simply don't fit our plans. They might even ruin them. But we can take our messed up lives and hand them to our Creator and Master Artist, and be amazed by what He can do with our lives. So get to know God better, love Him and put Him first in everything, and watch as God's plan is allowed to unfold in your unique life, in special ways made just for you. Sometimes we wonder how God can keep up - with so many praying and talking at once, each at their own pace, with millions of simultaneous requests, some in urgent life-or-death conflicts, and at the same time someone else sharing their thankfulness in the bliss of a summer breeze or an insiring cloud formation. But more often I wonder instead how He can slow down to our speed, fall into step with us, actually care about and love us, with so much else going on. Yet He can and does. I know there are more. Some day these things will be clearer - "For now we see in a mirror, dimly, but then face to face. Now I know in part, but then I shall know just as I also am known." (1 Corinthians 13:12) - I'm definitely looking forward to that explosion of awareness, or eternity of learning. Although I no longer watch "My Name is Earl" one of the early episodes had a scene in which Earl's Ex-wife was trying to kill him for insurance money, and sent him some poison cookies. The friend sent to deliver them warned Earl so he obviously didn't eat them, and set them aside. Later Earl's brother Randy shows up, sees the cookies, and is about to have one and Earl says "Don't eat those, they're poisoned". Randy hesitates, hand hovering, looks at Earl and asks "HOW poison?". We smile at that, that in order to enjoy a cookie Randy is willing to eat a poison cookie as long as it doesn't actually kill him. Yesterday I flashed on that scene as I was considering how we sometimes consider allowing sin in our lives. We wonder if it's really all that bad. We think "sure, it's not ideal" but we try to think whether or not this little bit is actually going to hurt us. In order to enjoy a movie we might put up with a little violence or profanity, not enough to kill our christian walk, just enough to make us a little sick is all (we hope). Perhaps we indulge in harmful substances that truly are a poison over time. I don't need to list the examples, we all know what our temptations are. While we easily recognize how wrong it is to eat a poison cookie, we have a little more trouble with "maybe just a little sin is safe" and although our Heavenly Father sees our every choice He is not forcing our decisions. My best advice is the next time you hear that soft voice warning you something is wrong, consider Earl's poison cookies and exercise your right to say "no" to temptation (or good times tainted with bad ingredients, as the devil loves to cook those up). It's easy to talk about how to beat temptation or how to choose the better path, but it has the negative effect of making the speaker appear holier or better than they are. This can make others lose hope, thinking that they have no willpower and see (seemingly) around them in their local fellowship with other Christians all these supposedly holy people.They start to think that church is not for them and that they don't fit in. I had spiritual downfalls this week, giving in to temptations and making poor choices, and as I come to God asking forgiveness and renewing my commitment for the one billionth time to try to do better and honor God, I realize I'm not alone. I feel bad, but this is a very real situation for so many, I just wanted to share for others who are struggling, battered by the feeling of failure. As Jesus told Paul, "My grace is sufficient for you." I have often wondered about the line "confess your sins one to another..." - that could simply mean going to those you've wronged and saying you're sorry, or maybe it means we should have a safe environment among the brothers and sisters in Christ that we can talk about the sins we have trouble with and get help and help each other. I wish there were more groups within most church environments where we can do that. Often it is the smaller groups that meet during the week for prayer where you can find this. I wish I remember where I heard this but I recently heard a quip: "Attendance to Church services shows how popular the pastor is, and attendance to the midweek prayer service reveals how popular God is!" That's not entirely true, but you get the picture. Your midweek prayer group will just be a different environment. I myself have broken every one of the Ten Commandments, and while it may not be a good idea to share our sins randomly at church, I just wanted to take a moment here on this blog to say: Take heart, there is none good, except for God. Don't let discouragement try to convince you that you're not good enough to come to God. Pick yourself up, dust yourself off, and take heart in the words of Christ "My grace is sufficient for you." If you ever get the chance to hear the story of the man who wrote "Amazing Grace" - it's a good example of how God reaches out to offer forgiveness to us all. This morning I read at Grantley Morris's site an interesting discovery he made when interviewing people who had been delivered from temptation by miraculous power - "I interviewed a number of people. I became increasingly perplexed to learn that it seemed everyone who had experienced such a miracle still had one addiction – often smoking, but not always – that caused them great shame and embarrassment as they kept floundering in their attempts to beat that particular habit." Why does God sometimes let us lose battles with temptations? - netburst.net. I always enjoy Grantley's insights. God won't prove Himself to us. This is so simple I'm surprised I haven't thought of this before. God won't force Himself on us, and therefore he won't prove Himself to us. That's why only a prayer of faith will accomplish anything. An answered prayer may in fact strengthen our faith, and years later we may remember that answer or miracle and it will anchor our faith for years or even a lifetime. But we had to have some amount of faith in the beginning. "So then faith comes by hearing, and hearing by the word of God." Rom 10:17. The beginning of faith comes from reading the Word, so that if you lack faith read the Bible and as you get to know God the Father and Jesus Christ the Son and their dealings and instructions for man, you begin to have faith and trust in our Creator. I could say more, but why? It is very straightforward. I always wondered why God required faith in order to answer prayer. Now I know at least a key reason. So many great ideas and companies are born because people wanted the product or service for themselves. We need something, and that thing does not exist yet. Or we interact with a provider of something, and they do it wrong or have such poor service that we decide to go into competition with them. Or we go to buy something and it simply costs more than we know it should, so we go create it, build it, do it - and a new company or idea is born. Find a need and fill it, the saying goes, and what better need to find and fill than our own? I think this motivating principal lies at the root of our tendency to be hypocrites - where we are finding the faults in others that are our own weakness and fault as well. Read on. But here is why we do that: Whatever our problems are, we are trying to improve and we're fighting our own bad behavior. Say we're trying to eat healthy. We may not be very good at eating healthy yet, in fact we may have just started some new willpower-testing regimen today, and we can hardly stand to see someone breaking the new rules we've just set up for ourselves, maybe downing junk food and soda, and our instinct is to jump all over them for it. We've "geared up" mentally to wage war against the bad behavior in ourselves and when we see the "enemy behavior" we're going to start shooting, (unless we're self-aware enough to hold our tongue and recognize the source of our zeal). I saw a show last night in which a monastary was depicted, filled with people who'd made a commitment to study God's word and spend much time in prayer and meditation. How convenient for the devil. Folk who get the Gospel and they then voluntarily quarantine themselves away where they can't infect anyone else. We do this also, to a lesser degree, when we send our kids to Christian school, or when we find a church denomination or church family and never get around to other churches or denominations. And when we go out in public we wear our politically-correct filter, like a hospital ward breathing mask, careful to filter out praise for our Creator, hope for Jesus' soon return, and anticipation of Heaven.